Sugar and spice, and everything nice, finished off with a wicked little kick in the pants. :) Ka-POW! 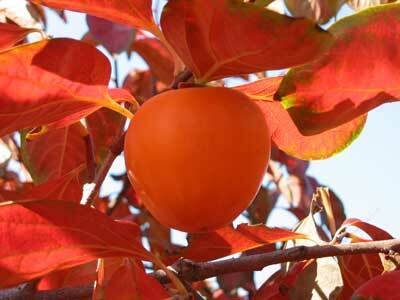 There are several kinds of persimmon trees, but only a few bear edible fruit. :) The two most common types commercially sold in the US are the fuyu and the hachiya. You can distinguish between the two different kinds by their shape, color, and taste: When ripe, the fuyu is a medium orange color and shaped a lot like a tomato (i.e., plump and squat) while the hachiya is a deeper shade of orange, elongated, and shaped like an acorn (except it's a lot larger!). The former has an astringent taste due to its high level of soluble tannins that will lessen as the fruit matures, while the latter is still astringent-tasting but is far less tart when ripe. The fuyu still contains tannins but has a lot less of them. Also, during the ripening process, the fuyu's tannins will disappear a lot faster than the hachiya's. Both kinds take a long time to ripen, but the hachiya takes even longer. Case in point: The hachiyas I bought this October JUST became ripe. :) It's now December 9th! And, I was even keeping them in the refrigerator, which is supposed to hasten their ripening. Well so much for that technique. ;) What I more recently discovered is that tossing them in the freezer for a minimum of 24 hours will speed up the ripening process even faster. Freezing breaks down the cellular membranes (i.e., the cell walls) of the fruit and also mellows out their astringent flavor. (Dehydration also has similar effects.) I already knew that freezing lemons and limes makes them easier to juice for the same exact reason, but it was certainly news to me that you could ripen persimmons this ways as well. A neat little trick, eh?! When it doubt, it's best to give a persimmon more time, rather than less, to ripen. Why is this, you might ask? Well, persimmons are seriously unpalatable if eaten prematurely, i.e., before fully ripened. 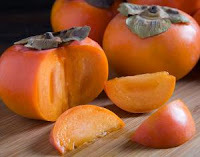 And trust me, you don't want to eat a persimmon before it's ready to eat, particularly the hachiya. Those who eat an unripened persimmon won't soon forget the experience. ;) Basically, your entire mouth will turn into a puckering hot mess, and will suddenly feel like it's become a pile of chalk. And what's even weirder is that it'll feel like something is sticking to the insides of your mouth, although you won't actually be able to find anything there. ;) It's completely maddening. The exact sensation veers on the indescribable. The tongue and mouth just feel incredibly odd. Like they've suddenly grown a coat of fur. Believe me, it's NOT pleasant. And not even washing your mouth out with a glass of water will get rid of the sensation. You just have to sit there and be patient, waiting for the feeling to fade. Kind of like an intensely hot chili pepper, it just spreads over your entire mouth and lingers until it fully absorbs into the walls of your mouth and throat. However, when persimmons have ripened, it's almost like you're eating an entirely different fruit. :) Like quince and the Nashi bear, the persimmon must first be allowed to blet, that is, to become incredibly overripe, before it's consumed. This bletting process is what makes the persimmon taste so incredibly flavorful. 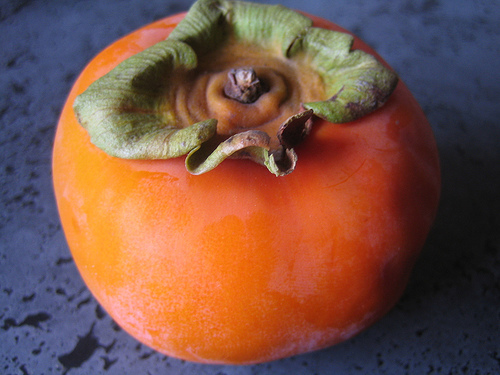 Of course, when I bit into the unripe fuyu I thought to myself, "Wait, this kind of tastes like a persimmon. Huh, that's weird." ;) And then, "Blech!" ;) Just like I'd remembered it. Chalky and mouth-puckeringly sour as hell. And then after some internet research, I realized, "Ohhhhh, it was a persimmon." Doh. 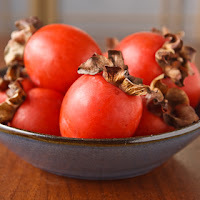 While the fuyu can be eaten as soon as they become slightly soft, I honestly prefer them when they become a little bit riper, verging on extremely soft and gooey. Many people like them when they are still firm, but to me, they still taste chalky and way too fibrous at this stage. They are commonly eaten raw. 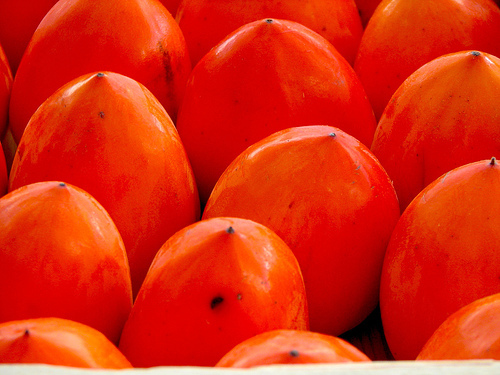 When ripe, fuyus have a mild, sweet and tart flavor. They have black seeds, which should be removed before consumption. Just pick them out as you encounter them. What fuyus look like on the inside. Hachiya persimmons have to be eaten when they are really, really soft, almost gushingly so. They are much tarter than fuyus and must be eaten only when they are overripe. Otherwise, they have that extremely bitter, chalky taste that I was warning you about earlier. However, overripe hachiyas are another matter altogether; they are incredibly soft and silky and taste like heaven. Unlike the somewhat fibrous texture of the fuyu, an overripe hachiya's pulp is smooth and almost liquified. 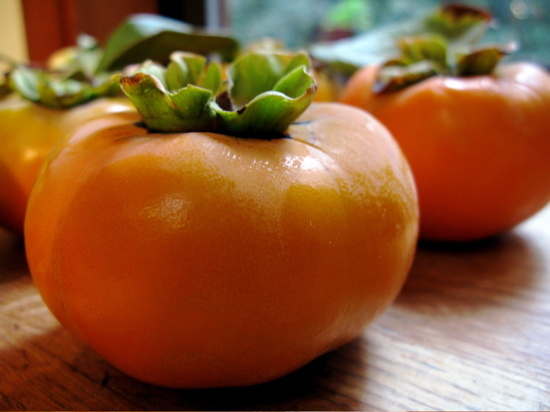 They are commonly thought of as "baking" persimmons, although you can eat them raw as well. They are usually peeled and pureed into a pulp before they are incorporated into baked goods. If you can't tell, I prefer the hachiyas. :) I love eating them raw. The gooier the better! A hachiya that's been cut in half. Directions: In a large and very deep sauté pan, combine the persimmons, orange juice, Cointreau, vanilla extract, and all spices. Bring the liquid to a boil, stirring occasionally. Then turn down heat to medium, cover, and simmer until tender, which, depending on the state of your ripened persimmons (i.e., soft, firm, etc.) could take anywhere from 20 minutes to an hour. ;) If persimmons need to cook a bit longer, add water, one cup at a time as the liquid cooks down, to prolong their cooking while keeping them from burning on the bottom. Reduce liquid to about half of its original volume. 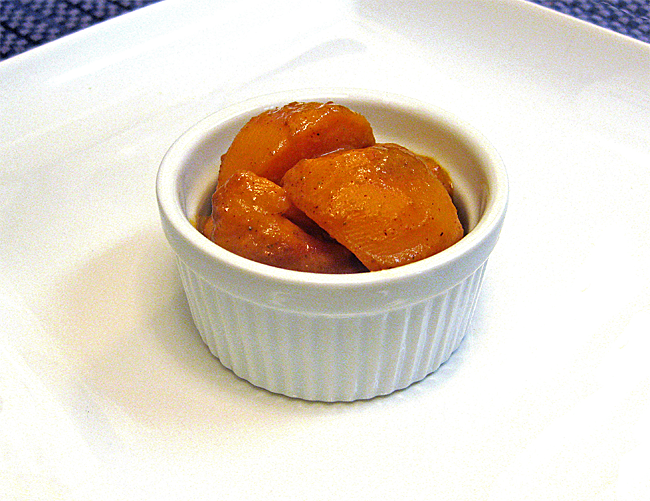 When persimmons are soft, remove pan from heat and stir in lime juice, blending well. Divide up fruit wedges into equal portions, and transfer with a slotted spoon to individual porcelain ramekins. Pour remaining syrup (from the pan) over top of each serving. Serve warm or chilled over ice cream or pudding (like peach melba). A bowl of hachiyas also make a pretty centerpiece. 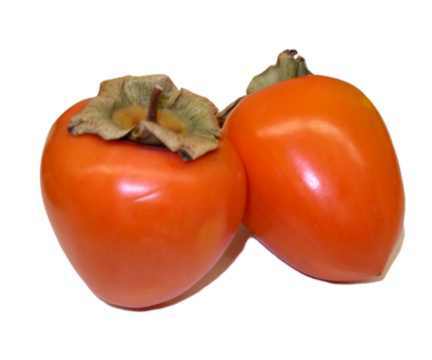 Chef's Notes: IMPORTANT - Be absolutely sure that the persimmons, especially the hachiya, are overripe, well past the point of soft. When you peel the hachiya, they should be gooey and oozing all over your hands. Yes, believe it or not, this is actually their most desirable, optimum state, in terms of taste. Otherwise, if you eat a persimmon before it's fully bletted, trust me, you're never going to want to eat another persimmon again. ;) As mentioned above, they will leave your mouth in a state of pervasive, chalky-tasting distress that can't even be eradicated with a glass of water. Believe me, before I truly knew what I was doing, I'd sampled both the hachiya and the fuyu before they were ripe, and let me tell you, I won't ever do THAT again. :) Yuck. However, when they're ripe, they're beyond fantastic. There's a reason they're likened to ambrosia. I have been making this recipe for years and I am always amazed with the new addition and the twists. After a bad start with these fruit they have become on of my favourite winter fruits and I have been eating them for many years, I had never tried them cooked however and wanted to give this a go. The first time I did it I used a variety called Rojo Brillante form Spain, also often called Spanish persimmons and widley available in the UK. 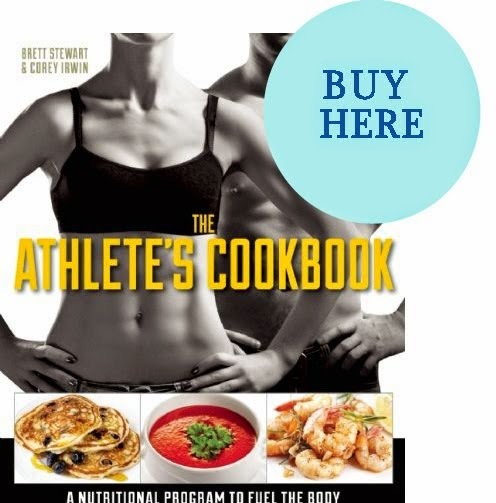 However it was unsuccessful as after cooking the fruits regained their astringency. I tried the recipe again with Sharon fruit from Israel and it turned out fine and was delicious. They tasted like dried apricots, orange juice and spices worked well, and I love using alcohol in cooking. I think this would work well with other fruit like peaches, nectarines or perhaps mangoes. I have come to the conclusion that the Rojo Brillante were unsuitable to cook this way, maybe because they are ripened artificially before export. !